KANSAS CITY, Mo. — Kansas City Chiefs fans are gathering from across the country as the big game against the New England Patriots approaches. From highways to the airport, fans are eager to witness history as Arrowhead Stadium preps for its first AFC Championship Game at 5:40 p.m. on Sunday. Fans decked out in Chiefs attire streamed off planes at Kansas City International Airport, many chanting ‘"Go Chiefs" as they walked from the gate to baggage claim. For many fans, like James Farrell, it’s also a homecoming. Farrell is a Kansas City native but now lives in Asheville, North Carolina. “This week the missus was traveling, so I brought the boys out with me," Farrell said. "He's pretty excited too. Obviously, when you're half the country away, it's hard to find people as passionate, but it's great get on a flight to see a sea of red travels well and then coming back home." Others are Chiefs fans who never lived in Kansas City, like Rob Pesale from New York. He became a fan of the team because his dad wouldn’t let him go to the Jets-Chiefs playoff game in 1969. “So you can imagine, being a 6-year-old looking forward to a game, I wasn't very happy, so I cheered for the Chiefs to win, and I've been a Chiefs fan since 1969,” he said. Of course, there also were a sprinkling of Patriots fans arriving, too. “We're like on our way to a sixth ring, has to happen. I'm so excited,” Heather Kaufman said. She brought a sign and said she will be in the first row at the 45-yard line and doesn’t think Arrowhead Stadium's noise will throw off quarterback Tom Brady and the Patriots. “I think it will drive Brady harder,” she said. Lifelong Chiefs fan John Altman, who now lives in Virginia, arrived with his son. “It's probably been 30 years since I've been to a Chiefs game,” Altman said. But he's eager to share the moment with a new generation of Chiefs fan. And while they hope for a victory, the game is more about the bonding experience this weekend. “This is worth it," Altman said. "This is literally a chance of a lifetime to share something with him. He starts college this next year. I already got my other two that are out of the nest and so to be there with him, it's just awesome." 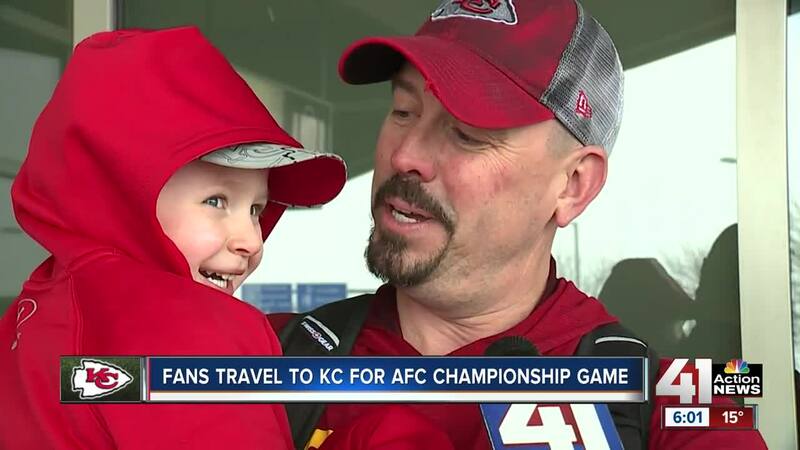 Some fans even told 41 Action News they’d rather come to Kansas City and experience the AFC Championship game in person than go to the Super Bowl because of the experience. Of course, they'll gladly take a win and earn that Super Bowl berth.